Whether you're designing a garden from scratch, creating the perfect patio or simply want ideas for your deck, effective, good-looking garden lighting is a must-have if your garden is to be usable as the nights draw in, for when you want to sit out on long, balmy evenings – and to enjoy from indoors when the weather is cooler. Follow our expert guide to find out how to plan your garden lighting. Redesigning a garden from scratch? Read our guide to get it just right. The best thing about garden lighting is that you can focus attention on plants and sculptures and totally ignore an unsightly shed or children's trampoline that you may only just manage to ignore during the day. The secret, however, is not to overdo it – only illuminate your garden's best bits, as a little light goes a long way in the dark. 'For another novel lighting idea, try positioning a spotlight at the base of an old brick or stone wall and see how the light grazes the wall above and throws the texture into sharp relief.' Try a similar trick with wall lights at shoulder height (above) to highlight a contemporary space and to provide practical illumination from one part of the garden to another at night. 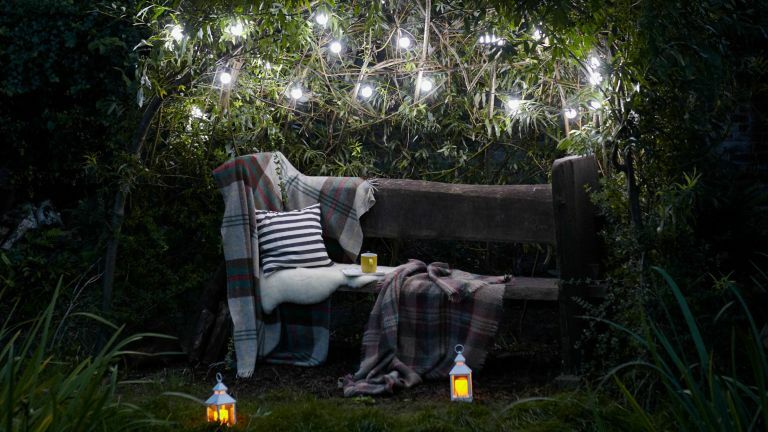 Fairy lights (above) are particularly effective at creating a magical mood in a garden. Drape them above French doors so they can be seen from indoors and out, or around dining areas to create soft mood lighting. Pendant lighting for the garden, usually suspended over a garden dining table is an effective way to help blend indoor and outdoor spaces, as is placing a standard lamp (below) designed to be used outdoors next to garden lounge chairs. If summer for you is all about having friends round for a barbecue, you won't just need to consider lighting up a garden dining or lounging area – you'll also want to brighten your cooking area, too. Think task lighting in this case; a well-placed spot that won't throw a shadow over your grill will do the trick. Which garden lights to buy? There is a vast range of garden lighting to buy. Putting aside the designs though, what do you need to know about garden lighting types, before you buy? Fluorescent lights are the most common lights for gardens. Most designs have 12-volt halogen reflector lamps that use less energy and are therefore more environmentally friendly. For flood lighting and security, choose large halogen beam spreads, but go for one with a PIR (passive infrared) sensor that can be turned off manually so that it doesn’t waste energy or ruin garden get-togethers. LEDs (light emitting diodes) are popular as they are particularly useful for long cable runs, and can be used almost anywhere: in step lights, as recessed spots in paving and decking, even under water spouts and fountains. Some LEDs come in different colours and there are others where you can programme the colour to suit the mood. You will pay more for LED lights than standard fittings, but the bulbs last a lot longer and the fittings are more discreet. Permanently coloured lights are best used in moderation and specifically in areas where a distinct focus or style is required. Fibre-optic lights for gardens are fairly new and cast a soft ambient glow, making them perfect for highlighting steps or decking. DIY kits are relatively cheap, though if you opt for a professional to fit them, it will cost more compared to installing LEDs or conventional fluorescent lights. Solar-powered lights are good for the planet and they won’t require any electrical skills to install them – perfect if you want to create an eco-friendly garden. Solar lighting offers great versatility and cost effective illumination. In terms of performance, they used to lose out to more powerful, traditional options, but this is quickly changing. It’s also worth experimenting with temporary outdoor lights, whether it’s for a summer garden party or a way of extending the festive Christmas spirit to your outside space. Wrap twinkly lights around arches and arbours, or drape them through trees or even pots and baskets. A warning, however: although some party lights can be left outside all the time, others need to be brought in when it starts raining. Improvised lights can also look far better than you might think, and what’s more they cost mere pennies and are very environmentally friendly. Tealights in old baked-bean cans or jars look great when used en masse. You can even paint the outside of jars with special glass paints for a stained-glass effect if you wish, and DIY stores stock bags of 100 tealights for less than £10, making them an easy and affordable way to enjoy your outdoor space throughout the winter months. Security lights, such as porch lights, offer a high intensity flood light effect that is unflattering for a garden and those using or viewing it. However, careful positioning of security lighting combined with the use of more ornamental lights throughout the garden creates not only a more aesthetically rewarding effect, but also aids the security by illuminating the whole garden in a variety of ways. Garden lights either work directly from the mains or through a transformer that provides a 12 or 24 low-voltage current. Both will need a qualified electrician to install them, but it is possible to fit some of the smaller low-voltage sets yourself once the power supply, usually a waterproof socket with an RCD (residual current device), has been fixed outside by a professional. Of the two, low-voltage lighting is best: it’s far safer, there are more fittings to choose from, it’s easier to install, and you can move the fittings around more readily. Working out the size of the transformer you’ll need to install is easy. Simply multiply the wattage and number of individual lights (bulbs) you want to use in your new lighting scheme. For example, four 30-watt lamps will require a 120-watt transformer. However, it’s always a good idea to go for a transformer that is larger than you think you’ll need, so in the future you can add more lights or up the brightness of the bulbs without the hassle of upgrading the transformer.